One of the highest growth rate areas in the label industry today is booklet label converting. Booklet labels have been around for over 30 years, but lately there seems to be an ever increasing demand for them. Some other terms for booklet labels (sorry search engines!) include expandable labels, multi-ply labels, expanded content labels, instant redeemable coupons (IRC’s) and foldout labels. Booklet Labels are mostly utilized by manufacturing companies that require a lot of text or information printed on items with space constraints. For example, a small bottle of medicine, or a bottle of household cleaner may require more printing space than is available on the substrate container. This morning I grabbed the Zyrtec allergy medicine from the shelf, and noticed that McNeil Pharmaceuticals used a single wrap around label on the square bottle. In order to read the tiny instructions, the bottle had to be rotated since the text wrapped around the sides of the bottle! Why print and supply a 10 page instruction manual, when you can include the same info on the product? Why package products differently for foreign markets, when you can include one multilingual label on the package or product? Why worry about legal hassles when you can print a detailed disclaimer or required regulatory information and affix it directly to your product? Government regulatory mandates will continue to increase, global markets will continue to increase, and the need to reduce packaging costs will continue to increase. These factors will drive an increased demand for fold out and booklet labels. 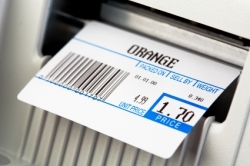 How can your business benefit from these type of labels?